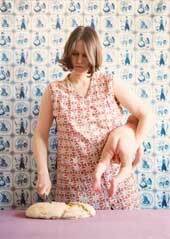 In doublebind twenty-seven artists reflect on their double role as artists and mothers. reveal how society deals with working mothers. --------- How do female artists combine art, children and career? --------- How does the art scene regard female artists with children? --------- What has changed in the last twenty years? will be published on a DVD that comes with the catalog of the exhibition. Location of the exhibition is Künstlerhaus Bethanien, Berlin. May 11th  June 9th 2003.